X-ray photoelectron spectroscopy (XPS), alternatively named electron spectroscopy for chemical analysis (ESCA), is now a well-established surface analysis technique capable of providing elemental and chemical state information from the outer 5 to 10 nm of a solid surface. It is the subject of several well-known texts[1,2,3]. There is also an excellent recent review of some of the latest technical advances. The technique is based on the photoelectric effect, discovered by Hertz in 1887, where the emission of electrons from a material occurs under photon irradiation. While early XPS experiments showed promise it was not until much later that the true power of the technique would be revealed. In the 1950s, Kai Siegbahn (Uppsala University, Sweden), using a high resolution spectrometer and a Cu Kα X-ray source, for the first time resolved the sharp peak at the high kinetic “edge” seen by previous studies. This enabled, for the first time, accurate determination of photoelectron kinetic energies and thus core level binding energies. In 1981 Siegbahn was awarded the Nobel Prize for Physics for this pioneering work. where Φsp is the work function of the spectrometer (typically 4 to 5 eV). 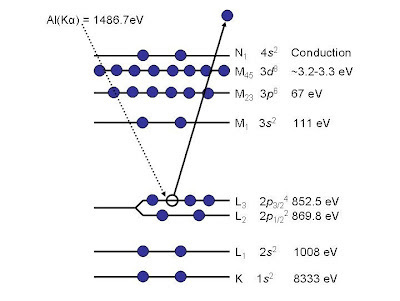 The various core level binding energies observed in a spectrum can be used to identify all the elements of the periodic table except for hydrogen and helium. Chemical state information can also be extracted because binding energies are sensitive to the chemical environment of the atom. Chemical environments that deshield the atom of interest (i.e. are bound to strongly electron withdrawing groups) will cause the core electrons of that atom to have increased binding energies. Conversely, decreased binding energies will be measured for core electrons of atoms that withdraw electrons from their neighbouring atoms. Essentially, binding energy will generally increase as chemical state number increases. As an example, niobium metal has a 3d5/2 binding energy of 202.2 eV, while niobium 2+, 4+ and 5+ oxides have binding energies of 203.7 eV, 206.2 eV and 207.4 eV. Tabulations of binding energies can be found in a variety of databases[6,7]. Figure 1. 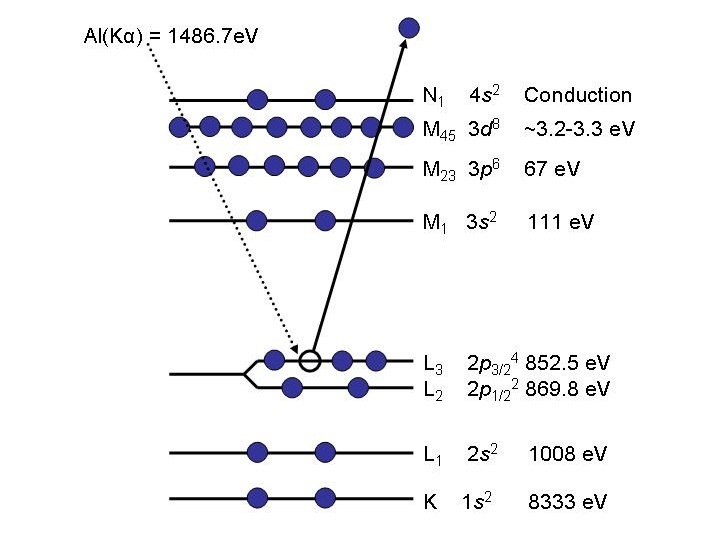 Schematic of the photoemission of a Ni 2p3/2 electron from a nickel atom. S. Hufner, Photoelectron Spectroscopy, Solid State Science Series, vol. 82 Springer, Berlin, 1995. D. Briggs, M.P. Seah (Eds. ), Practical Surface Analysis by Auger and X-ray Photoelectron Spectroscopy, John Wiley & Sons, Chichester, 1983. D. Briggs, J.T. Grant (Eds. ),Surface Analysis by Auger and X-ray Photoelectron Spectroscopy, IM Publications, Chichester, 2003. C.S. Fadley, J. Electron Spectrosc. Relat. Phenom. 178/179 (2010) 2. D. Briggs, J.T. Grant, Perspectives on XPS and AES, in: D. Briggs, J.T. Grant (Eds. ), Surface Analysis by Auger and X-ray Photoelectron Spectroscopy, IM Publications, Chichester, 2003, pp. 1-12.